Since the birth of our second child, I’ve had to become a little more creative in my approach to operating contests. There are rare days when both children are in phase with their eating and sleeping needs and we can accomplish some things, and then there are the other days. With the coincidence of the quadrennial World Radiosport Team Championship (WRTC) and IARU HF World Championship contests this year, I thought I would make a game of trying to contact all 59 of the competitors rather than maximizing contest score. 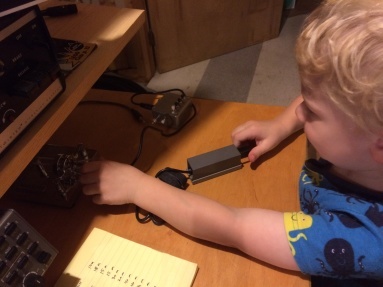 The motivation for this is that WRTC was in New England this year, which is a stone’s throw away from me and middle-of-the-night operation would yield QSOs with the WRTC stations on 40 and 80. I did end up working all 59 of the WRTC stations with their distinctive 1×1 callsigns by furiously searching and pouncing on both radios on 40 and 80. In fact, I worked most of them twice before I finally found K1T. I’m going to do an analysis of the standings of the teams versus when I worked them to test if any of the teams were better at “marketing” than others. Should be fun! Anyhow, all of these operators were really outstanding but a special congratulations to N6MJ and KL9A who seem to have run away with the whole thing operating as K1A. 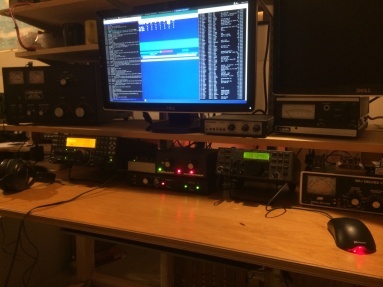 In the lead up to the contest, I finally managed to get the station fully SO2R (single operator, two radio—essentially the ability to operate interference-free duplex on any pair of HF bands) again. And, in the process, I have automatic band switching again, so I don’t have to run across the basement to switch antennas. Thank goodness for small conveniences. Here’s the mess for low-power (100 watts and less): KK1L 6×2 switch to connect two radios to any of six antennas, W3NQN single-band 200-watt transmitting filters for each band (10-80 meters shown here since I still don’t have a 160 antenna yet), and the K6KV-K8GU triplexer that allows me to share the feedline to the G3TXQ broadband hexagonal beam with both radios. All this stuff was homebrewed by me but it is all available in commercial form as well. I’ve described the W3NQN filters considerably in the past, but the triplexer is new (built in March 2014) and since I’ve had some e-mail traffic from a couple of people who know I built one, I’ll probably write something up on it in the next few weeks. 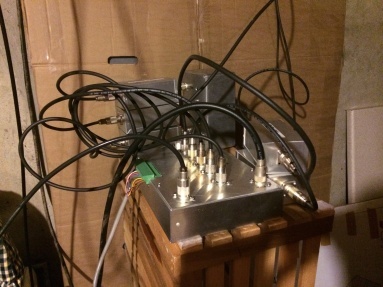 I mention it here because WRTC is actually one of the events that popularized the use of triplexers, which are downright freaky when you think about plugging two 100-watt class radios into a box that separates/combines the signals. Electrical engineering for the win on this one. Anyhow, I based my triplexer off the K6KV QST article from June 2010, finding some beautiful Johnson capacitors in a flea market for $5 each and using leftover toroids from the W3NQN filter project instead of the solenoid coils used by K6KV. The whole thing set me back about $30 total and it works great with the W3NQN filters, to say the least. This was the second contest with TRLinux contest software by N6TR and W9CF. It has some idiosyncrasies, such as the effect of CAPS LOCK on the shortcut keys. For example, did you know that ALT-r is not the same as ALT-R? The great thing about it is that TRLinux talks natively with the YCCC SO2R+ box that I use to handle keying and audio switching for both radios. And, the band data is handled by the YCCC SO2R+ with TRLinux, so I didn’t have to buy a band decoder for the K2. That whole process of setting up the band decoding was another midnight oil project Friday night before the contest started. Fun and games. But, it worked flawlessly.